The multimodal transport hub will integrate the existing Terminal-1 and two phases of Terminal-2. BENGALURU: The Kempegowda International Airport (KIA) has witnessed such massive growth in terms of air passenger traffic that Bengaluru will become like London’s Heathrow airport in a few years from now, claimed Hari Marar, Chief Executive Officer and Managing Director of the airport operator Bangalore International Airport Ltd (BIAL). Bengaluru airport will become the gateway to a new India, he said. “When Phase-I of the second terminal is completed in March 2021, an additional 25 million passengers are expected to use the airport while Phase-II, when completed, will cater to another 20 million passengers,” he added. Apart from the terminal, a second runway, expansion of access roads, a remote parking that will accommodate 2,000 taxis and a new multi-modal transport hub form part of the development plan. “It will be a terminal inside a garden,” Marar said. There will be much thrust on greenery with hanging gardens, which will be a big draw. Sustainability, technology and innovation and showcasing the art and culture of Karnataka through digital media will be other plus points, he added. A dedicated art and culture museum, ‘Art Lounge’ will also find place here. Dense fog resulted in suspension of flight operations at KIA for an hour on Thursday. 61 flights was disrupted. Flights were not operated between 6.46 am and 7.53 am. A total of 48 flights had a delayed departure while 10 flights had a late landing. 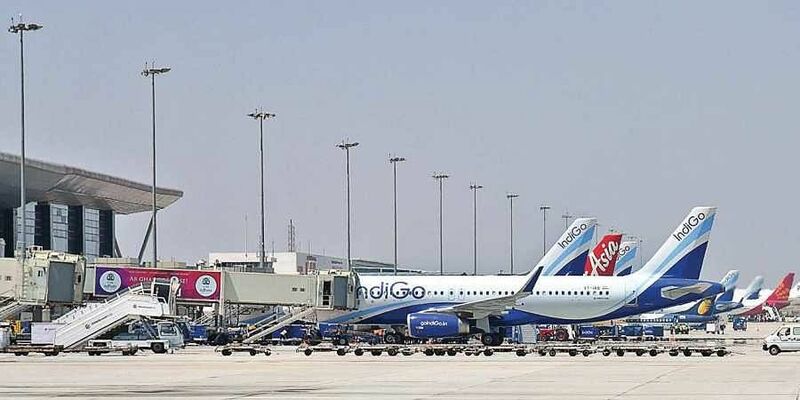 Three flights, one each of Blue Dart, IndiGo and GoAir were diverted to neighbouring airports.